Centre for Research and Information (CRI) and its youth platform – Young Bangla (YB) is back once again after the successful initiation of the ‘Joy Bangla Youth Awards’ (JBYA) held on 2015 and 2017. Joy Bangla Youth Award is a quest for acknowledging the untold stories and contributions of young achievers and leaders of all over Bangladesh. JBYA is a CRI-Young Bangla initiation to seek out the young champions of change of our county. With a vision to recognize the young achievers across the county, portray their untold success stories before the nation and untie them under one platform, CRI launched the country’s biggest youth mobilization initiative YB in November 2014. The call for the Joy Bangla Youth Award application has been officially opened since August 21st, 2018. So far, 110 Town Hall Activations have taken place at the Upazila Level in the Districts of Bagerhat, Barisal, Bhola, Brahmanbaria, Chandpur, Chapai Nawabganj, Chittagong, Comilla, Cox’s Bazar, Dinajpur, Gaibandha, Jamalpur-Sherpur, Habiganj-Sunamganj, Jessore, Jhenaidah-Kushtia, Khulna, Kurigram, Lalmonirhat, Magura-Rajbari, Meherpur-Chuadanga, Meherpur, Naogaon-Joypurhat, Narail, Natore, Nilphamari, Noakhali-Laxmipur, Pabna, Rangpur, Satkhira, Shariatpur-Madaripur, Sirajganj and Thakurgaon. At the two-day long Town Hall Activations, dedicated Activation Team Members are facilitating online and offline form fill-up for the applicants of the Joy Bangla Youth Award 2018. Young Bangla Members are also helping the applicants with all relevant information to make their application process easier. There will be 140 Town Hall Activations in total at the Upazila Level across the country and Campus Activations will be conducted in 18 university campuses across the nation. District Level Activations will be conducted from 19th September, 2018 to 4th October, 2018. The application window for the Joy Bangla Youth Award 2018 opened on August 21st, 2018 and will remain open until September 30. 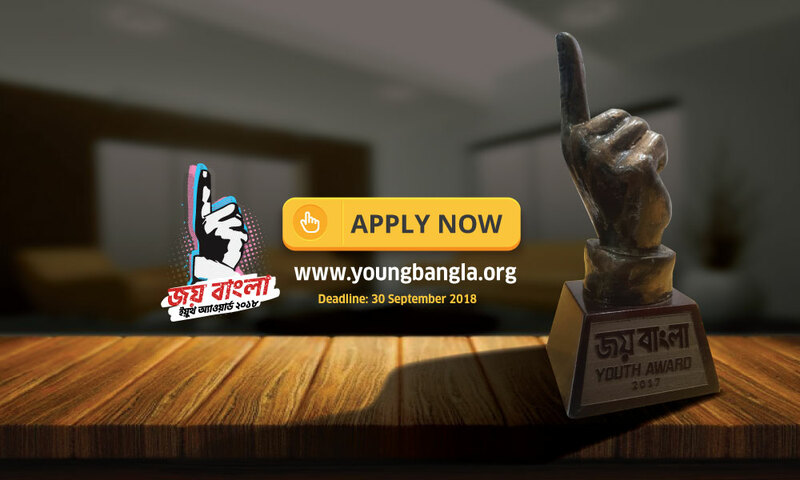 During this period, organizations, who believe that they deserve the award, can apply by filling up an online form available on the website http://youngbangla.org/member/joy-bangla-youth-award-2018.php. During the month-long process to the JBYA 2018, Young Bangla collects application forms submitted by different youth-led organizations from different parts of the nation. The selection process will shortlist organisations according to their contributions, social acceptability and scope of work in the future. There will be a primary scrutiny, following which CRI-Young Bangla teams, including winners of the 2015 and 2017 Joy Bangla Youth Awards, will conduct field visits to the applicant organizations. Based on the outcomes of these visits, CRI-Young Bangla will come up with the final list of candidates for the Joy Bangla Youth Award bring held on October 2018 in Dhaka. Award Winners get to showcase their works and progresses to the nation from the JBYA 2018 stage, enjoy a more respectable status in their respective communities and get the opportunity to participate in various development projects with the Government and some non-government organisations. To submit your story of Joy Bangla, visit www.youngbangla.org and https://www.facebook.com/YoungBanglaSummit/ (Facebook) or call our Hotline 09612009922 for details.